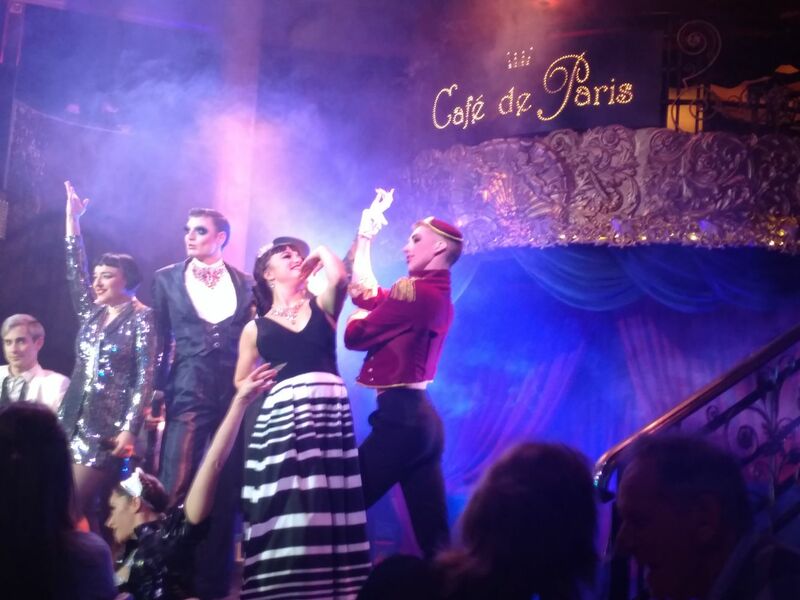 Somehow, for reasons that are still unexplained, we won tickets for Cafe de Paris so on a Friday night, we went. 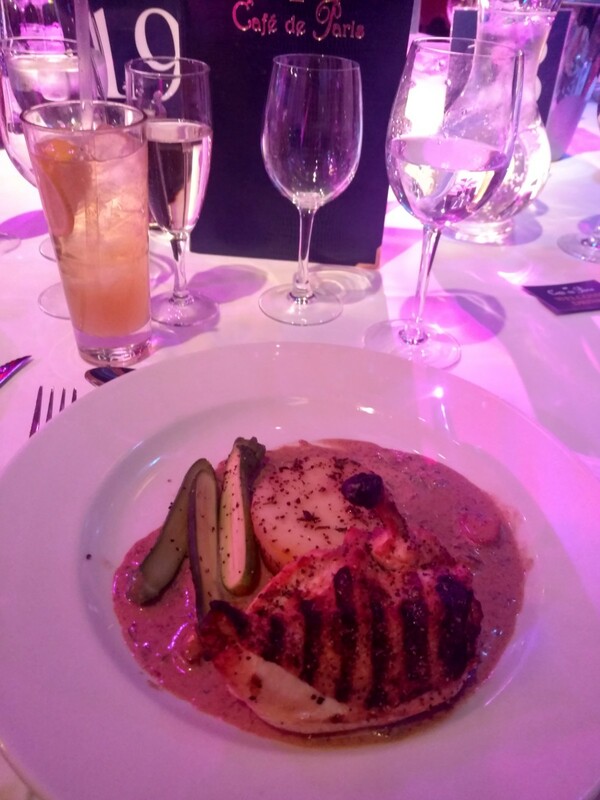 Once we were there, unbeknown to us, we were actually entitled the VIP package which allowed us the three courses, a bottle of Prosecco and two free drinks. Unfortunately, or fortunately for me, Mrs Mayochup was pregnant at the time therefore could not drink anything alcoholic so the whole bottle of Prosecco and free Kir Royale was mine. Be rude not to waste it. 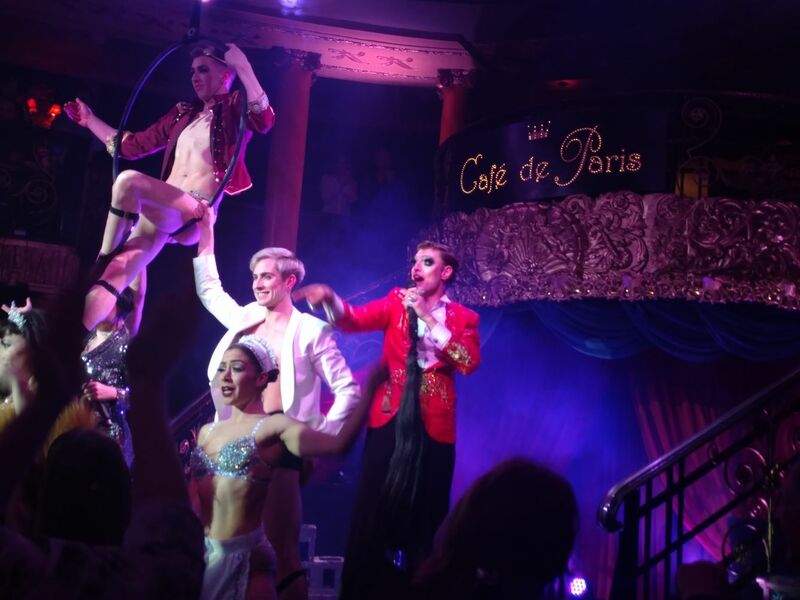 We previously posted about Cafe de Paris and we were pleased to see that Ruby was still the MC who is still at his flamboyant best terrorising the gentlemen who he took a shine to. The acts were truly amazing and it’s hard to comprehend that us human beings can perform like that whether it being balancing on one hand on a raised platform to performing acts with fire. Over the course of the evening, it must have been the first time in its history that there were no hen parties but of course there were other celebrations like birthdays and anniversaries. For starters, we went for the smoked chicken and papaya on blini. 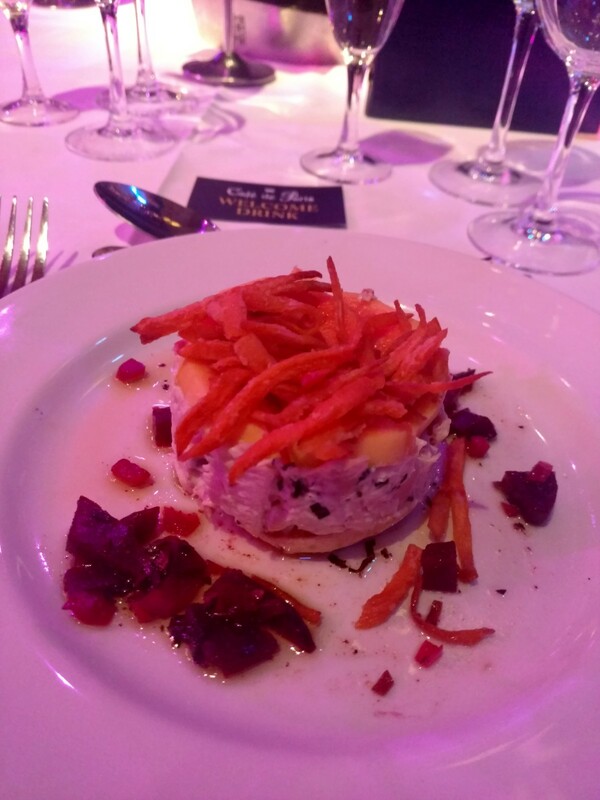 This comes with beetroot & shallot dressing and sweet potato confetti. 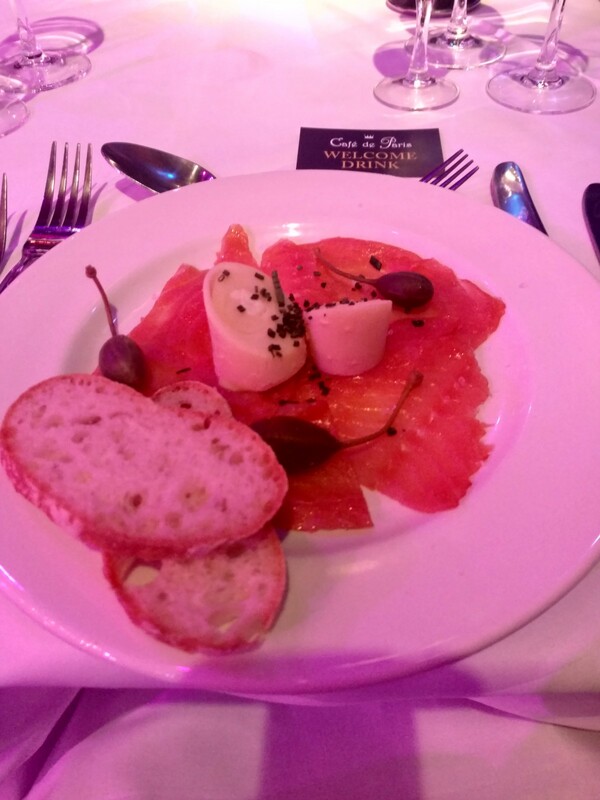 The other starter was the cured salmon carpaccio with palm hearts, caper berry and rock salt. The salmon is no different to what you have in hundreds of other restaurants, light and refreshing but the smoked chicken and papaya was amazing. Surprisingly light and full of flavour. Between meals, we were treated to a magician plying her trade with card tricks and misdirection. 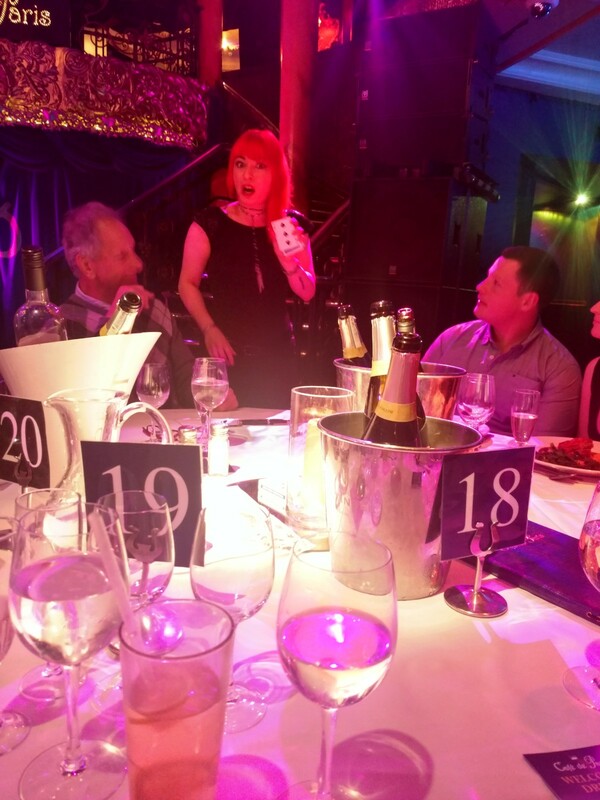 One guy on our table thought he had it worked out but the magician had him sussed and got nowhere. We forget her name but she was at the Edinburgh Film Festival, not that narrows it down much. 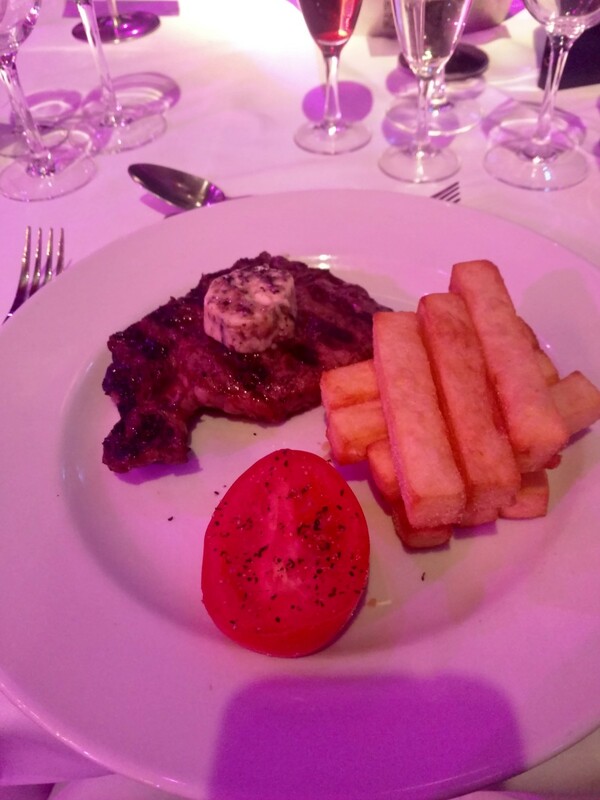 For the mains, we got the prime rib-eye steak with hand cooked chips and garlic butter. The other was grilled chicken breast which comes with courgettes, potato fondant, girolle mushrooms and parsley. Both were well cooked and well received. Especially as one of us was drinking a lot and needed to soak up the booze! 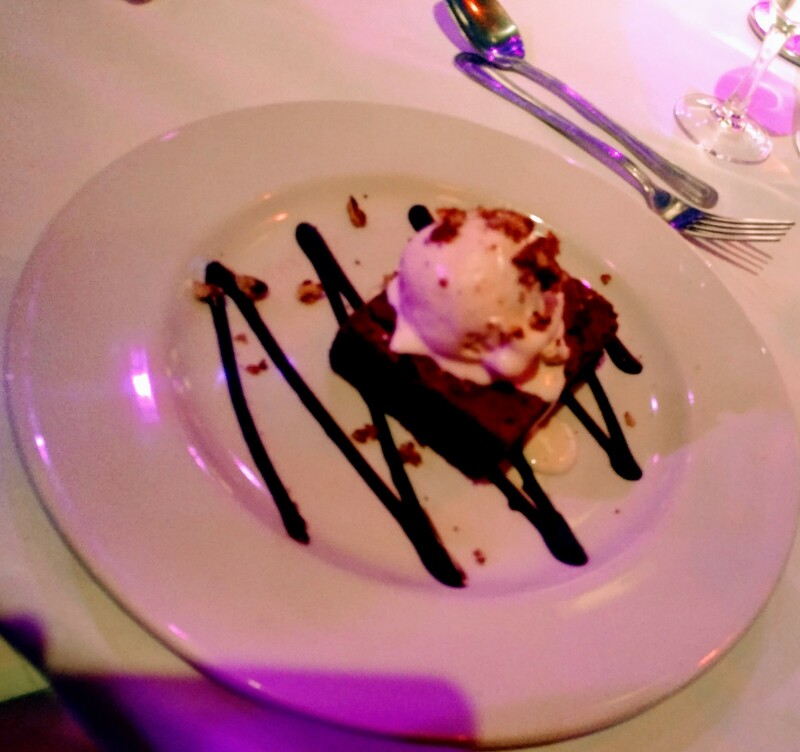 We thought we were only eligible for two courses so to have dessert was a bonus. 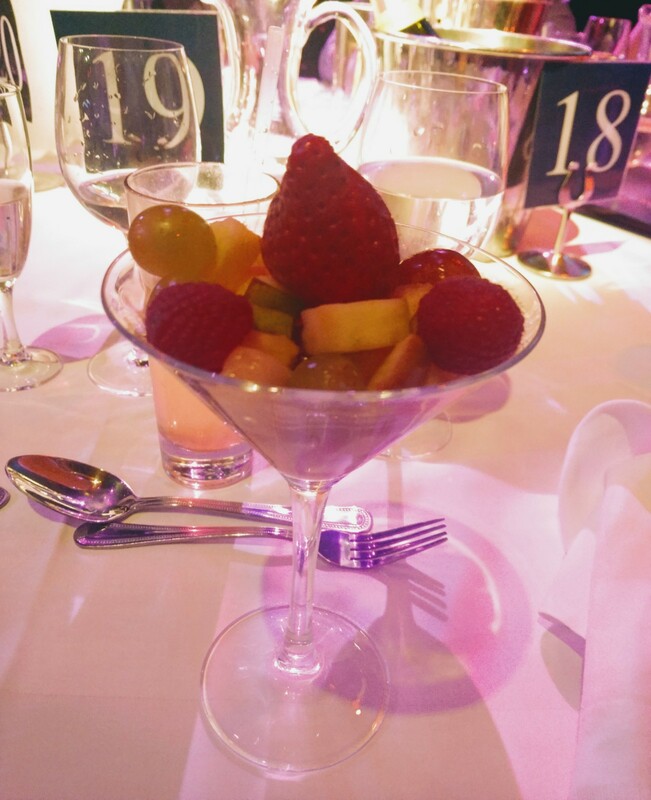 We opted for fresh fruit salad and warm chocolate brownie. We do recommend coming here even if it's not just for the food. The entertainment is fantastic and worth the entry fee alone. It was great that you specified the events. Also, I really love all of those delicious food Cured salmon carpaccio with palm hearts is one of my most favorite.